An insider’s view from the far, far reaches of the artworld, where there be dragons. It's a rare treat to see so many Hepworth sculptures all in one place. She is acknowledged as a major figure and influence of 20th century art, and yet some issues remain as to how Tate Britain has chosen to curate and present this retrospective. The exhibition starts with a strange oxymoron of a statement, about it being a usual view that when Barbara Hepworth and her contemporary Henry Moore started working in the 1920's, it was assumed that artists didn't carve by hand. Really? So soon after the Arts and Crafts movement? Although Futurism and Modernism were embracing mechanism at this time, and although it was more usual to make models, there are plenty of examples of hand carving - not everything was cast. It's such a distraction to be confronted with my own wrong initial double negative assumption. 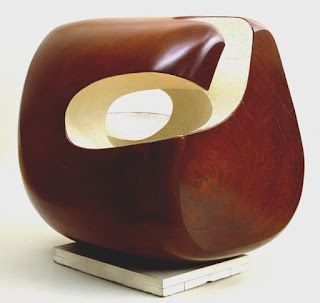 Naturally it makes sense to show an artist's work in terms of their contemporaries and collaborators, and especially in Hepworth's case the work of her husband the artist Ben Nicholson, with whom she exhibited. Usually in such a major retrospective it would be expected to focus purely on the artist, to have a chance to closely examine a wide range of their work. I don't remember such exhibitions of, for example, Henry Moore's work starting with a mixed room including Hepworth and Jacob Epstein's work by way of explanation or contextual orientation. A retrospective is a chance to see the artist in their own contextual world, somewhat abstracted from other art events apart from those they were directly involved with such as in print or other collaborations. 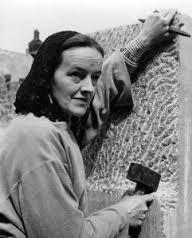 Barbara Hepworth was a woman artist in what was still frankly largely a man's world. She was an artist of great strength and vision who embraced the challenges of life, of motherhood, who worked through war and marriages and built up a considerable reputation in her lifetime. She didn't need her artistry to be defined by the work of others then, and she doesn't need it now, and considering her drive and resilience, it is particularly insensitive to contextualise her with work from Moore and Epstein, as comparison to these men plagued and frustrated her professional life. And so to the work. Sculpture for a Modern World is well titled, as we see the formation of new ideas, new revelations about what lies within, new geometries and new meanings emerge through Hepworth. What a feel for materials she had, and what exquisite technique. A few of the larger wooden pieces are showing signs of breaking the bounds of her will, time and natural processes distorting the shapes. Wood has a mind and a will of it's own, with undercurrents of grain and knots and direction. It's a marvel to see Hepworth's balance of mind and matter, as she so often reveals the best of her materials while creating spacey forms. It's the internal carving and the inserted rods which are still thrilling to contemporary eyes - they still look like work for the future, but perhaps for a future which has already vanished, or which we have since taken a side step away from. The inner colour is often a blue - a sort of aqua, minty, municipal swimming pool, 1950's plastic earring blue, probably with a touch of green in it. It's space blue. It's a blue which is hard to replicate now, but I wish Tate Britain had been able to paint the walls that blue as a magical and sympathetic setting for these precious forms. A highlight of the exhibition is a film of Hepworth working in her garden at St Ives. She herself was something of a sculpture. Oh yes, you want to touch them, to embrace them really. 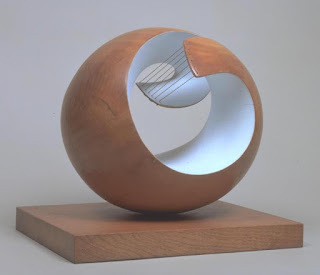 Barbara Hepworth was an artist with rare sensitivity and strength, and ability to create her true vision. At once delicate, imaginative and intriguing, these shaped blocks point to a future still to be achieved. I am an artist making and exhibiting moving image, installation, sound and art contraptions. Born in Glasgow, Scotland, and currently living and working in London, I originally trained in classical music. Using video, photography, recordings, drawing and low-tech construction, my work distils abstract and scientific notions into beautiful insights. I have an MA in fine art (Open College of the Arts 2014) and a BA first-class in fine art (Middlesex 2006). Research interests and a fascination in psychology has currently led me to undertake an Msc in the subject (Hertfordshire 2017). I make gallery-based work and often set up projects for myself. I run theViewergallery pop-up for artist projects and moving image screenings, and work as a covert artist in residence. I mentor and tutor, and review and write about books, exhibitions and culture. © copyright Eleanor MacFarlane 2014-19 all rights reserved. Awesome Inc. theme. Powered by Blogger.